The project requirements were high: ATEX conformity, compliance with the guidelines for being awarded CE marking, a new S7 control system as well as a modern ball segment valve were the objectives in a project of a leading international customer from the pharmaceutical industry. Since the start of the project, the HEINKEL Drying and Separation Group was able to successfully implement the objectives within eight months. As a long-term partner with a comprehensive product portfolio, the HEINKEL Group was the first port of call for the client's planned changes. 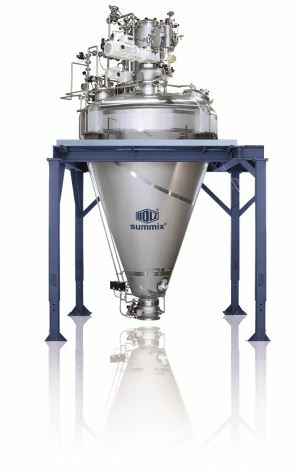 The job was to modernize the conical screw vacuum dryer from BOLZ-SUMMIX, which had been in use for more than 20 years, and add to it a new control system and a new ball segment valve. The complete mechanical refurbishing of the dryer the customer uses to manufacture pharmaceutical products was the first phase of the project. First of all a detailed risk analysis and functional description of the system were created to ensure ATEX conformity and fulfill the guidelines for being awarded CE marking. The subsequent steps were defined on this basis: For example, ATEX-compliant mechanical seals including a monitoring and supply system, drive motors, sensors and actuators had to be installed. A central focus was also the modernization of the system with a new drive and control system including control panel, guaranteeing the safe and convenient operation of the dryer. The local control panel was programmed with Simatic TIA from Siemens and offers the customer a user-friendly interface with intuitive operation. The use of modern control engineering increases both the productivity and the service life of the system and enables worldwide remote maintenance with reliable tamper protection. The customer also replaced the ball segment valve. The new HEINKEL ball segment valve minimizes the problems of baking experienced to date and enables convenient cleaning. This is why the vacuum- and pressure-tight process valve, which offers a number of additional functions, was customized with an inspection opening with a blind cover, CIP cleaning, a heatable ball segment as well as a flushing flange with nitrogen purge. In this project, the corporate group proved its successful, cross-group collaboration and realized the customer's ambitious goals in a relatively short project time.